A few minutes exposure to U.S. cable news gives the viewer the impression that Iran is relentlessly carving out an empire in the Middle East. This is approximately as absurd as the proposition that Vladimir Putin is striving to recreate the empire of the tsars. Talking heads who never think to mention Israel’s wars of aggression since its inception (much less its nukes), or the pattern of NATO expansion (= U.S. imperial expansion) since the end of the Cold War, bristle with indignation at any reported shipment of Iranian arms to some Shiites (or anyone, really) somewhere, or any Russian effort to thwart the expansion of a hostile military alliance along their borders. The fact is, Iran has not invaded another country since the 1730s, when Nader Shah waged war on both the Ottoman and Mughal empires and established an ephemeral empire stretching from the Caucasus to the Indus Valley. 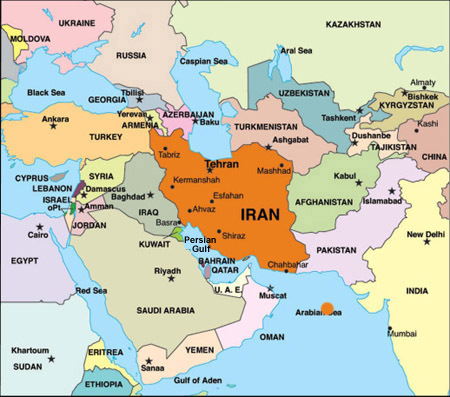 In modern times Iran has been the victim of repeated attacks and encroachments on its sovereignty—by Britain, tsarist Russia, the Ottoman Empire, the Soviet Union just after the Second World War, and Iraq (with U.S. blessing and support) from September 1980 to August 1988. But it has not directly attacked any of its neighbors. In 1953 the U.S. itself engineered a coup in Iran against a democratically elected prime minister (to prevent his plans to nationalize the oil industry). It imposed on the Iranian people the brutal, tyrannical rule of the Shah up to 1979. In the latter year, in the most genuinely mass-based revolution in Islamic history, the Shah was overthrown. Ever since then the U.S. has held Iran in the cross hairs, applying economic sanctions, freezing its U.S. bank-holdings, even providing Iraq in the eighties with military aid and satellite intelligence as Saddam Hussein waged an aggressive war against his neighbor. All to punish the Iranian people for having the audacity to (at least try to) shuffle off the shackles of imperialist hegemony. But how has it intervened? By supporting with funds and weaponry south Lebanese forces fighting Israeli aggression and occupation? Why should the Arab League find anything wrong with that? Should the Arab League oppose Hizbollah, perhaps the most powerful political party in Lebanon, its support largely earned by forcing the Israeli occupiers out in 2000? Has Iran intervened in Syria by supporting the internationally recognized Syrian government, as it fights an armed opposition dominated by al-Nusra al-Qaeda forces and the hideous Islamic State? If so, has it intervened more than the U.S.—which is barking orders to Bashar Assad to step down, supplying arms to the opposition (many now in the hands of ISIL), and openly boasting of its plans to create a mercenary force for Syrian regime change in Jordan? The U.S. not so long ago threatened missile attacks on Syria, on the dubious pretext that the regime had used chemical weapons against its people and thus deserved such punishment as could only be properly inflicted by the “exceptional” nation and global policeman. Obama was at the verge of pulling the trigger when deft Russian diplomacy checked his hand. Has Iran ever behaved so irresponsibly as has the U.S.—in Iraq, Afghanistan, Syria, Libya, Pakistan, Yemen—herever it sets its feet? Has Iran intervened in Iraq—that proud nation with a glorious past utterly destroyed and humiliated by the sadistic U.S. invasion and occupation, now facing the Islamic State nightmare that was obviously generated by the stupid smashing of the Baathist secular state—by assisting its regime (placed in power by the U.S., not Tehran) from the advancing ISIL crazies? And if it has, doesn’t the U.S. secretly welcome that intervention, because the troops it trained itself proved to be impotent in the face of the child-beheaders? Has Iran intervened in Bahrain, a country where, during the Arab Spring of 2011, there were huge peaceful demonstrations crushed by Saudi troops? The opposition was rooted among Shiites, who constitute 65% of the island nation’s people, ruled by a Sunni monarch whose regime oppresses their faith. But there seems to be little evidence of Iranian involvement. It was hardly necessary. The discontent was and is born out of local circumstances. Has Iran intervened in Yemen, a country whose modern history has been shaped by British, Saudi, and Soviet rivalries, and which has a complex ethnic-religious make-up that includes a huge Shiite minority population (maybe 35%) somewhat sympathetic to Shiite-ruled Iran? A country forced by the U.S. since late 2001 to cooperate with its “War on Terror” rejected (according to one poll) by 99% of the Yemeni population? There may be some substance to the allegation that Tehran is materially supporting the Houthis. In 2013 the Iranian vessel Jihan 1 was seized off the Yemeni coast and the 9 crewmen on board arrested for smuggling. The cargo included Katyusha rockets, heat-seeking surface to air missiles, rocket-propelled grenades, explosives, ammunition and Iranian-made night vision goggles. But eight of the nine arrested were soon released, there were reports that the ship was bound for Somalia, and Iran denied any responsibility. Of course, if Iran’s Revolutionary Guards are materially aiding the Houthi movement it shouldn’t surprise anybody. How many armed opposition movements has the United States supported, from the “Cuban Democratic Revolutionary Front” defeated ignominiously in at the Bay of Pigs in 1961, to the Kurdish Democratic Party peshmerga in Iraq in the 1970s, to the Contras in Nicaragua and Mujahedeen in Afghanistan in the 1980s, to the “National Transitional Council” in Libya in 2011 and today’s (small, disintegrating) “Free Syrian Army”? Last September when Houthi forces took Sana’a (virtually without a fight, and with apparent widespread support), the Iranian regime and press were enthusiastic. They might have noted that a Houthi-dominated government would be a return to the status quo that existed between 1918 and 1962, when northern Yemen was governed by Shiite imams. They owed nothing to distant Iran and indeed from the 50s were beholden to Egypt for support. But now Saudi Arabia—which in its fanatical intolerance of Shiite “heresy,” and in its fear of its own Shiite minority (maybe 25%) has even indicated its willingness to cooperate with Israel to topple the Tehran regime—wants to depict events in the neighboring nation as the result of a conspiracy by the Iranians in league with their fellow heretics. The Saudi-led “coalition” that has amassed to fight the Houthis is a coalition of Sunnis who want to curb growing Shiite power in the region. That is the basic issue here. Iran is by far the largest Shiite-dominated state in the world, and while its foreign policy is not actually driven by a pan-Shiite strategy, it is depicted by Shia’s intransigent foes as the headquarters of Shiite advances everywhere in the world. The religious differences between them are as significant as those between Lutherans and Baptists, both of whom are Protestants (as opposed to Roman Catholics) but whom have not always been allies historically. To suggest that all Shiites from Afghanistan to Yemen are in cahoots to establish a new Persian Empire is just stupid. Surely there is a serious fear factor here. Perhaps 25% of Saudi Arabia’s 16 million people are Shiite believers. They are concentrated in the oil rich east, in a swathe of territory facing the Shiite-majority island nation of Bahrain. Like those in Bahrain, they embrace the Twelver version of Shiism that prevails in Iran. (Zaidi and Ismaili Shiism flourish along the Yemeni border.) The Wahhabis governing Saudi Arabia have historically oppressed these minorities, even destroying their holy sites. Leading clerics in the theocratic state repeatedly denounce them publicly as apostates from Islam. That’s pretty unambiguous, I’d say. This problem, you will say, has nothing to do with the U.S. And it shouldn’t. But it does! I keep hearing on CNN and MSNBC “Iran is believed to be supporting” the Houthi rebels in Yemen. “Is believed”? What does that mean? The same folks say “it is believed” Iran has a nuclear weapons program, although the entire U.S. intelligence community has repeatedly said they don’t think that’s true. “It is believed” should be translated, “We want you to believe.” It’s that simple. By WHOM is it believed that Iran is supporting the Houthis? you want to ask. I cited above some inconclusive evidence. But here you have the voice of true conviction, the echo of a State Department talking point. How many would believe it if it weren’t repeated again and again, without substantiation? In a leaked cable dated Dec. 9, 2009, U.S. ambassador to Yemen Stephen Seche reported matter-of-factly: “Contrary to ROYG [Republic of Yemen Government] claims that Iran is arming the Houthis, most analysts report that the Houthis obtain their weapons from the Yemeni black market and even from the ROYG itself.” Who profits from contending otherwise? I suggest that those who see things in religious terms (like the Saudi leaders), and fear the prospect of religious pluralism within the Islamic world, and the reasonable empowerment of Shiites along the Arabian Peninsula littoral, benefit from a propaganda campaign that tars all Shiites with the brush of Iranian associations. Again, it is like the Cold War-era smearing of all kinds of people and movements with the charge that they had to be receiving Soviet or Chinese support. And those in this country who want to attack Iran, and always seeking justifications for such an attack, jumps at any Sunni accusation of Iranian (Shiite) “aggression” to build the case for U.S. moves against the Islamic Republic. Of course the Shiites of Iran feel indignant at the oppression of their coreligionists in many countries in the Middle East. But are their responses a bid for empire, or statements and gestures of empathy? It’s not like the capitalists in Tehran and Masshad are profiting mightily from Iran’s support for allies in Syria, Lebanon or anywhere else. The agreement announced April 2, between the 5+1 powers and Iran, is a significant step back from the U.S. road to war with Iran encouraged by the curiously paired Israelis and Saudis. It’s a signal that the neocons who have dominated U.S. foreign policy well into the Obama era, in alliance with buttheaded politicians rooted in the Christian-Zionist right, are becoming less able to vilify at will, spouting disinformation unchallenged to reach the goal they hardly endeavor to conceal: the total destruction of the status quo in the Muslim world, and its abject surrender to the U.S. Empire. Still, with the odious Netanyahu spurring them on, they try. And this, strangely enough, means drawing on sensationalist Saudi charges of Iranian ties with regional Shiite communities. The sneering Zionist makes common cause with Salafists presiding over an anti-Semitic culture, versus a country that constitutionally insures its religious minorities representation in parliament. Iran must be depicted as hell-bent on expansion, although there is little evidence for this. And even if the U.S. is backing off from the nuclear hysteria, conspicuously breaking with its Chicken Little fear-mongering ally on that point, it is still collaborating in the vilification of Iran as a fearsome empire-builder. The well-educated youth of Iran tweet one another, sharing laughs about U.S. perceptions of their country and the manifest ignorance about their region prevailing in the west. They know their ayatollahs aren’t responsible for the Baathists in Syria, Hizbollah in Lebanon, the Bahraini activists or Yemen’s Houthi militants. But they know the Manichaeans in Washington, whose brains are wired to think “Good vs. Evil,” are happy to take their cue from their Saudi Sunni friends who want to smash the Shiite presence whenever it gets uppity. They in turn guide the U.S. press, who will continue to tell its audience “it is believed” Iran is the root of all evil in the Middle East. And they’ll never betray the slightest knowledge of, or insight about, a significant historical conflict between religious communities in the Middle East.